… while the weather is amazingly sunny and warm (82) on this Thursday of Spring Break week. We spent Easter down in Clemson, SC with family and giving Thomas one last look before deciding between William & Mary and Clemson. He has given himself a deadline of this weekend to decide so we’ll keep you posted. Today, I have had a chance to publish a new cashmere design that you will love! 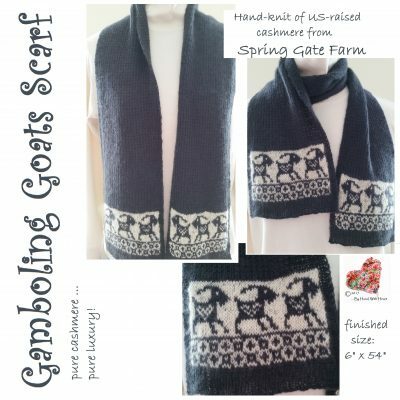 I call it Gamboling Goats Scarf (and it matches the Gamboling Goats cap I designed a couple of years ago). This 6 x 54 inch scarf uses lots of cashmere (400 yds of main color and 100 yds of contrast) for the sample shown (with directions for a longer scarf … adding another 200 yds to the main color needs) but is well worth the cost to make this sumptuous accessory. The knitting is fine (with a gauge of 10sts x 12rws = 1″ in Broken Rib!) but the fabric will be cozy warm for those sharp winds of winter. 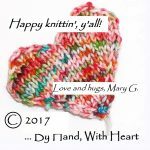 The pattern is available in my Ravelry store, Craftsy page and, for those in Europe, on LoveKnitting! I have a couple more designs to post over the next day or two … so check back and check ’em out! Thanks Linda … you’re always such a wonderful cheerleader!